The Art Studio: Registration for private art lessons. All registrations are by appointment only. Prior to the first lesson, I will meet with both you and your child. It will take approximately 5 minutes. Time Slots: Per parent's request. Summer lessons are encouraged to be scheduled for more than one hour a week. Bring a friend special discount! $25 for each. Cost: $35 per lesson or $130 when pre-paying for set of 4 classes. Cost: $30 per lesson each, 2 hour min. Payment form is check, cash and all debit and major credit cards with one swipe using Square or use our on-line store. 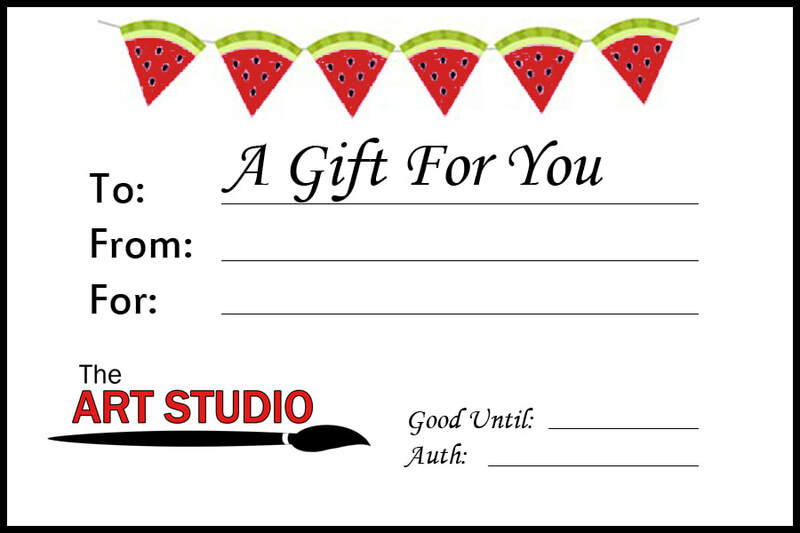 Gift certificates to The Art Studio are the perfect gift. What a great gift from grandparents or friends that want to encourage your child's artistic passion. Available for any amount and for any occasion! Last minute gift? No problem. We will mail it to the recipient for you in a fun homemade artistic card, or send it to you directly. Gift certificates expire 12 months after purchasing date. All lesson packages are 6 lessons with ALL supplies included. Cancellations: If the student needs to cancel a lesson and cannot schedule a different hour that week, there will be a $35 fee charge. Your spot is being held exclusively for you. I will do my very best to fit you in on another time and date if possible. Lateness: If the student is late for his/her class, that time is lost. The student will still be required to pay the full session fee regardless of how much time is left of the scheduled class. Arriving on time is appreciated as private lessons are scheduled every hour and need to start on time. If you're caught in traffic, please let me know you are currently on your way, by calling 308-379-0691. If a student arrives late, their lesson will still end at its scheduled time. Prompt pick up time is also appreciated as I will often have a lesson beginning when your lesson ends or have a lesson at another location and need to get to it on time. If I am caught in traffic or running late for any reasonable reason I will call you and your lesson begins when I arrive for the full hour. I will wait 10 minutes maximum at your home if you are not there when scheduled. After 10 minutes, I will leave and you will be billed for that 1-hour lesson.